Graduation Rates of CTE Students show the lowest graduation rate (M=76.3%), while reduced lunch status students show the same level of graduation rate as that of paid lunch status students (M=86.3%). The 4-year graduation rate by Career Cluster as defined by the National Association of State Directors of Career Technical Education Consortium (The Sixteen Career Clusters, 2013) for Mississippiâ&#x20AC;&#x2122;s CTE students in the 2007-2008 cohort was calculated from the disaggregation of the overall group. Among all of the Career Clusters, Health Science shows the highest graduation rate (M=92.3%), as demonstrated in Table 5. The second is Information Technology (M=89.7%), and the third is Education & Training (M=89.6%). 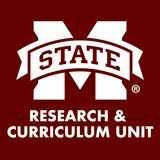 The 2007-2008 cohort students who took courses in the Agriculture, Food & Natural Resources Career Cluster had the lowest overall graduation rate (M=74.5%). The second lowest graduation rate was shown by the Manufacturing Career Cluster (M=79.2%). Some of the results for currently implemented Career Clusters were low due to initial implementation in the cohort year. For example, the Finance Cluster had 0 graduates, and the Education & Training Cluster had 60 graduates. 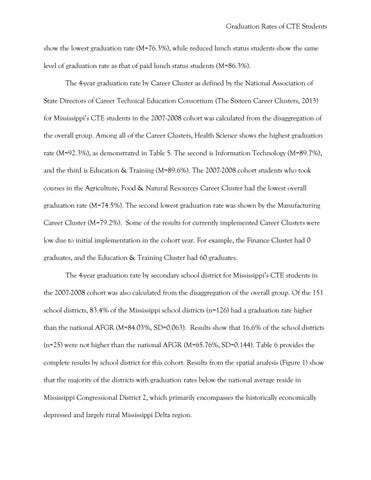 The 4-year graduation rate by secondary school district for Mississippiâ&#x20AC;&#x2122;s CTE students in the 2007-2008 cohort was also calculated from the disaggregation of the overall group. Of the 151 school districts, 83.4% of the Mississippi school districts (n=126) had a graduation rate higher than the national AFGR (M=84.03%, SD=0.063). Results show that 16.6% of the school districts (n=25) were not higher than the national AFGR (M=65.76%, SD=0.144). Table 6 provides the complete results by school district for this cohort. Results from the spatial analysis (Figure 1) show that the majority of the districts with graduation rates below the national average reside in Mississippi Congressional District 2, which primarily encompasses the historically economically depressed and largely rural Mississippi Delta region.